As Britain’s health service staggers towards the fearsome – or at least flu-ridden – British winter, a pernicious idea is quickly becoming a consensus view: The NHS is a bottomless pit. The logic is deceptively simple. Between 2010 and 2020, NHS funding will have gone up £35bn — this at a time of national austerity. Yet waiting time targets are being missed, more than half of NHS trusts are expecting to end the year in financial deficit, and nearly a third are planning to lay off staff, including many mental health trusts. Earlier this year, 23 hospital trusts declared a “black alert”, meaning they were so overcrowded they could no longer guarantee patient safety. It seems that no matter how much money you throw at it, the NHS simply cannot cope. Perhaps — say it softly — a free health service just isn’t viable in the 21st century. Don’t believe a word of it. The NHS is doing an extraordinary job. It’s treating more people and delivering better outcomes than ever before with funding at an historic and international low. There is a simple way to fix the NHS. And the answer is money. Here are the facts laid out by the most respected health think tank, the King’s Fund. Under Labour, NHS spend rose from 6.3 per cent of our national income in 2000 to 8.8 per cent in 2009. That’s why, when Labour left office, public satisfaction with the NHS was at a record high. Today, NHS funding has fallen to just over seven per cent of GDP. On government spending plans, it will continue to decline to just 6.6% in 2020. That, according to the wonks, is the “largest ever sustained reduction in UK NHS spending as a percentage of GDP”. In other words, we are tragically under-funding our health system. And that pretty much explains everything we see today: hospitals at risk of closure, waiting lists at record highs, staff shortages, NHS Trusts in deficit, cancer survival rates well below our European neighbours. To borrow a phrase, there’s nothing wrong with the NHS that can’t be fixed with what’s right about the NHS. That, and a truckload of cash. How much? NHS chief Simon Stevens told us this week that Britain is spending about £23bn less than France and Germany. If we simply kept pace with economic growth, we would add about £16bn to NHS coffers. Either number sounds good. The problem is that not even Labour, an anti-austerity party, is currently offering it. Just as in 2015, Labour’s efforts this year to ensure its manifesto was fully costed led us to the strange position of serving relatively thin gruel. Under Ed Miliband, the NHS Time to Care fund promised £2.5bn extra for the NHS, nowhere near the £8bn that Simon Stevens asked for two years ago. The Tories promised the £8bn. Although that pledge was later discredited by Nuffield Trust and others, it put us in the strange position of going into a general election offering less than the Tories for the health service we founded. This year wasn’t much better. Labour went into the 2017 election promising less for the NHS (about £8bn extra) than for scrapping tuition fees (£11bn). Under John McDonnell’s spending plans, the percentage of GDP we spend on the NHS would still be falling. 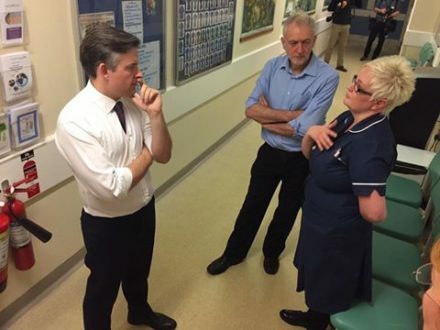 So how to pay for a decent NHS? It’s a knotty question. Norman Lamb, a Lib Dem former minister, has proposed a cross-party commission to take health funding out of politics. It’s a fascinating idea, though it’s hard to see how such a crucial issue for British voters could ever be taken off the political football pitch. One option is to re-evaluate our own priorities. Is a tuition fee pledge that benefits the wealthier half of the country really more important than a health service that helps everyone? Another option is to look at our fiscal rules. Labour has committed to continuing to reduce the deficit. But the deficit is already relatively low. This year it will come in at around 2.6 per cent of GDP according to the independent Office of Budget Responsibility (OBR). That’s well within the EU’s “growth and stability” rules for eurozone countries and considerably better than France’s fiscal position. The government’s pledge to take our deficit from its already low position today to zero in the early 2020s could mean another £50bn in spending cuts over the next five years. One option is simply to stop reducing the deficit. Keep it “strong and stable” (to quote a phrase) and spend half the £50bn on our health service. The NHS remains Labour’s proudest achievement. It’s one of the best and most efficient health systems in the world and it helps everyone – everyone – without a glance at creed or colour or class. Austerity is breaking it. It can be fixed, but it can’t do it on its own. Let’s give it the money it needs to be truly world class. It will be the best £23bn we ever spent. Adam Swersky is a Labour councillor in Harrow in London.